A Moveable Feast, published by Lonely Planet, presents a collection of travelers' tales set around the world, written by a well-seasoned spectrum of contributors, from celebrity chefs and best-selling travel writers to never-before-published travelers. 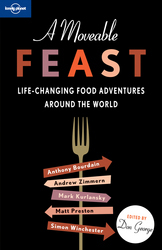 Edited by Don George, A Moveable Feast includes stories from Anthony Bourdain, William Sertl, Jan Morris, Pico Iyer, Simon Winchester, Mark Kurlansky, Andrew Zimmern and Matt Preston. A Moveable Feast presents a collection of travelers' tales set around the world, written by a well-seasoned spectrum of contributors, from celebrity chefs and best-selling travel writers to never-before-published travelers. The theme threading through this delectable multicourse concoction will be the inimitable ability of food to inspire our serendipities, satiate our senses and enlighten our journeys – in short, to transform the planet into an endless all-you-can-eat buffet for mind, soul, and stomach. Don has been a pioneering travel writer and editor for three decades and frequently appears as a travel expert in print, on radio and on TV. He has visited more than 70 countries, published more than 750 articles in newspapers and magazines around the globe, and has won numerous awards for his writing and editing.